Stifel's Barry Bannister - head of the firm's institutional equity strategy - was one of the few strategists who correctly called the February VIXtermination slump that knocked the major indexes from all-time highs. Fast forward to today when Bannister is out with a new note, according to which investors could be in trouble heading into next year as the Federal Reserve continues to tighten monetary policy, and keeps hiking rates. Specifically, Bannister claims in a new note that just two more rate hikes would put the central bank above the so-called neutral rate - the interest rate that neither stimulates nor holds back the economy. The Fed's long-term projection of its policy rate has risen from 2.8% at the end of 2017 to 2.9% in June. And, as the following chart, every time this has happened, a bear market has inevitably followed. That said the Fed has a choice: it may not hike, which leads to the following dilemma: "cross the neutral rate in 2019 to forestall late cycle inflation or remain below neutral and foster speculative bubbles." Fed Chair Powell has yet to tip his hand whether he leans more toward controlling inflation or avoiding the bursting of the biggest ever asset bubble. "Although some say the neutral rate is difficult to observe, stocks see the barrier quite clearly,” Bannister wrote. “A ‘maximum tolerable peak’ for the fed funds above the neutral rate has been associated with bear markets since the late-90s global-debt boom." 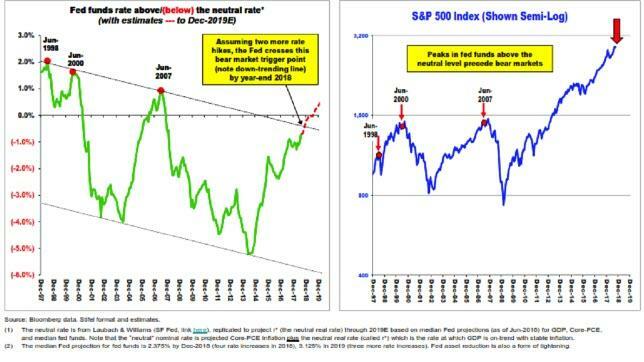 He shows this dynamic in the following chart in which Bannister notes that assuming two more rate hikes would lead the Fed to crossing the bear market trigger point some time before the start of 2019. "Timing the next 20 percent bear market is difficult due to policy distortion, but 'within 6-12 months' seems assured," Bannister wrote according to CNBC. Worse, "history indicates that the next bear market may be quite rapid, probably exceeding the reaction time of the Fed." Having already hiked rates twice this year, the market is virtually certain the Fed will hike again at the end of this month; meanwhile estimates for another rate hike in December are at 72%, suggesting that according to Bannister's methodology the recession could begin as soon as the new year. And yet, with both the labor market and inflation now on the verge of overheating, Bannister says the Fed has no choice but to continue tightening. "The fed funds rate has been held below the neutral rate for a decade," he said. "Weighing stability versus mandate, we believe the Fed has no realistic option other than follow its projected dot-plot path, eventually revealing the speculative excesses created in the past decade." Bannister says another indicator also points to a bear market: the equity risk premium (ERP). This measure is the market's earnings yield (inverse of the P/E ratio) minus the current yield on the 10-year Treasury. It's another way of showing what stocks are worth vs. bonds and currently it is showing stocks at levels of valuation that have triggered bear markets in the past, including in 2000 and 1987. 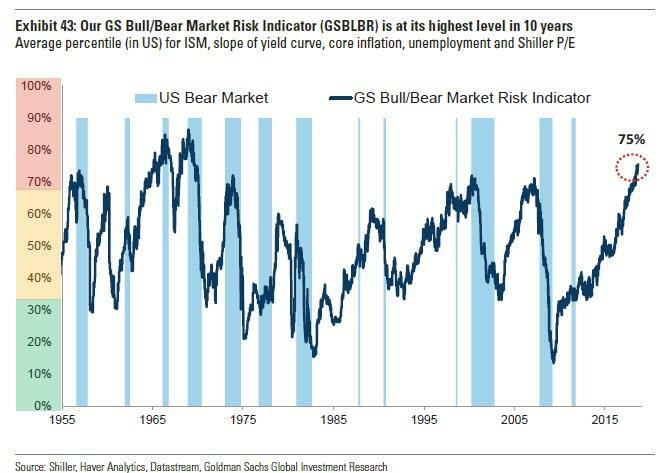 Incidentally, that's similar to Goldman's latest warning: recall that yesterday we showed that the bank's proprietary Bear Market Indicator is now above the level last seen in 1987 and 2000, suggesting a bear market is imminent. Bannister's recommendation? Get defensive and go with stocks that benefit historically when the dollar and bond prices rise. His recommends buying utility stocks such as Sempra Energy, biotechs like Amgen, and household products companies such as Procter & Gamble.